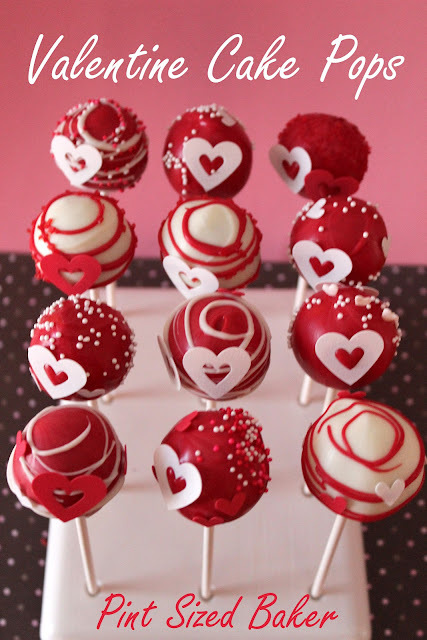 Enjoy the love of Valentine’s Day with these delicious Valentine’s Heart Cake Pops! They make perfect goodies for Valentine’s Day parties! Oh, I big puffy heart love Bon Jovi. 1990’s Bon Jovi to be exact and I was singing this song the entire time I was making these Valentine’s Day Cake Pops. I love how the heart cake pop has an edible arrow going though it! Look out Robin Hood, I’ve got pretzel arrows and I’m not afraid to use them! These pops were actually quite tricky to make. I don’t think I would have made much more than the six that I did make. Adding those pretzels were a bit more difficult than I anticipated. You need to be very careful pushing the pretzel in so that you don’t dislodge the pop from the stick and could fall off. I also ran into the stick inside a few times and I had to hold the pretzels in place until the coating dried. 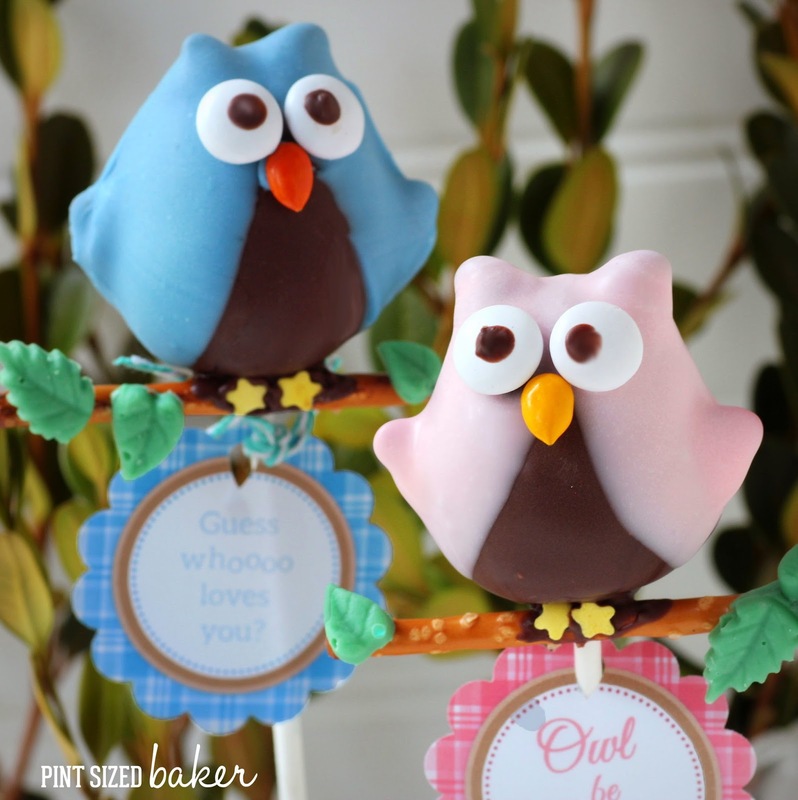 These would not be a good first timers cake pops to attempt. If you’er looking for easier pops, try just added the gummy hearts to basic pops. They still look great and the kids will love them! Start off making your cake pop dough and shaping your pops. 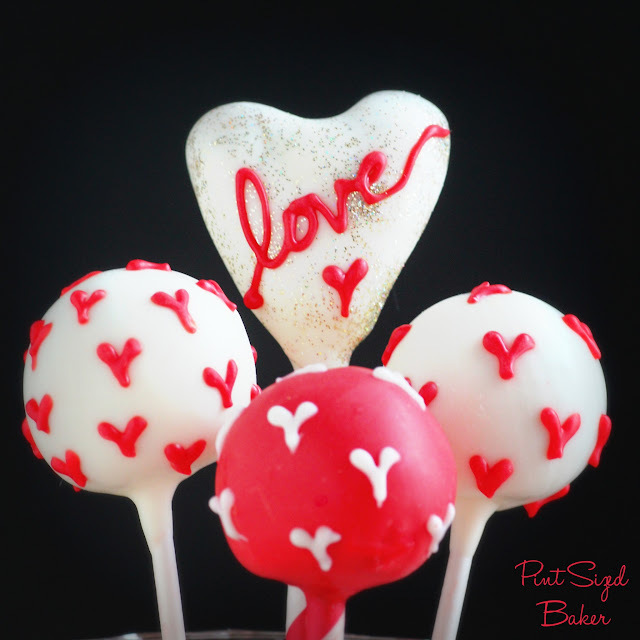 You can check out my Cake Pop Batter Video and my shaping hearts tutorial if your are new to cake pops. Make six hearts and roll the extra dough into spheres. Place the shaped dough into the fridge on a cookie sheet lines with wax paper. Make your pretzel arrows. Add a gummy heart to a pretzel stick. to make the feather end, cut away some of the curved tops of the heart then insert the pretzel stick. Set them aside. Melt your red candy wafers. Place them into a large ceramic mug and microwave for 1 minute. Stir them up and microwave again for 40 seconds at 70% power and stir until all the wafers are melted and the candy coating is smooth. Remove the shaped cake pop dough from the fridge. Dip a lollipop stick (or straw) into the candy and insert it into the heart. Do this only if you want them on a stick. If you want to stand them up, simply add a candy dipped pretzel into the pop and use that as the “stick”. Once all the pops have sticks, dip the pop into the red candy. Dip straight up and down without turning or moving the pop in the candy. Tap off the excess and wait for it to drip off. Coat the wet candy in red sugar and very, VERY carefully insert the arrow head and tail into the pop. I broke off half the pretzel before inserting it. Be careful if the lollipop stick inside the pop. Hold the pretzel rods in place until the candy is dry. Stand up and complete the pops. If you want them to stand up, make a little resting spot for them on the wax paper and simply use the arrow head as your handle and dip the pop. Shake off the excess, sprinkle with sugar and insert the tail pretzel. Stand it up on the little spot and wait for it to dry so it doesn’t topple over. Give them to your favorite Valentine! They’ll appreciate your hard work.